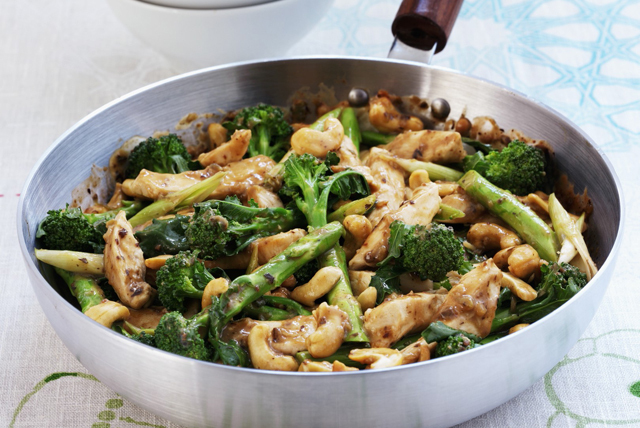 Our chicken and broccoli stir-fry recipe comes together in a flash. Chicken, broccoli and onions - yum! It's a simple, elegant and flavourful stir-fry recipe. Heat oil in large nonstick skillet or wok on medium-high heat. Add chicken; stir-fry 5 min. or until chicken is evenly browned. Add broccoli and onions; stir-fry 5 to 6 min. or until chicken is done. Add garlic; stir-fry 1 min. Add dressing mixture; cook and stir 1 min. Top with nuts. Prepare using a pork tenderloin, cut into bite-size pieces.